This is a “Torpedo 1936” page by Jordi Bernet, page 3 from the story “Every Dog Has His Day”. This story is anthologized in “Torpedo 1936” Volume 1, published in America in 1984. 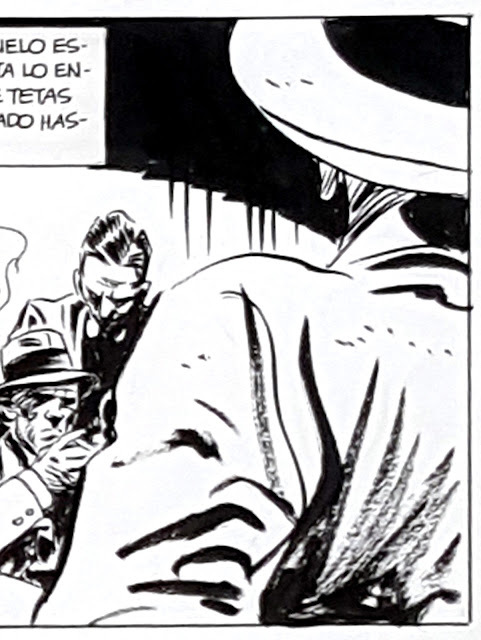 It’s the first Torpedo story drawn by Bernet after the character’s co-creator, Alex Toth, dropped out after illustrating the first 2 adventures. I purchased this page at the San Diego Comicbook Convention in the late 90’s. Was it Comic-Con International by that time? The dealer I to whom I paid $600 was international, German I believe. 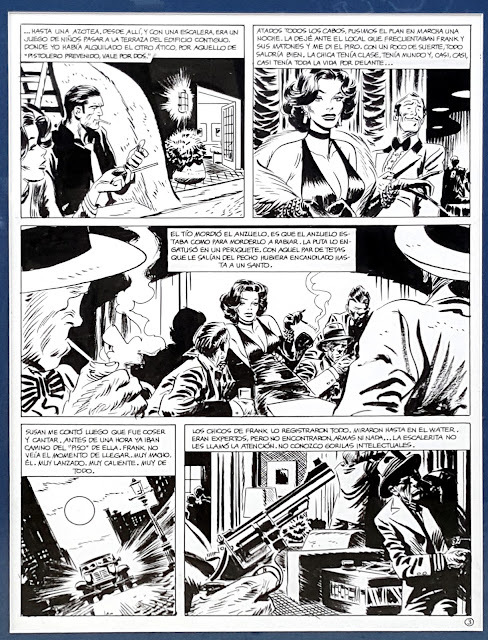 I feel I lucked out on this page; it has everything—cool film noire lighting, great spotting of blacks, a beautiful woman in 2 panels, a cool close-up of a gun… But this page fucked me up, in a way, the same way Tony Salmon’s inks on “Lovecraft” did—when I tried to imitate his bravura looseness (I had the original to this page leaning on my drawing board as I tried to ink) when I was inking the Fogtown graphic novel, all I got was crude and crappy. Check out the folds on the back of this guy’s jacket. Mere mortals can’t get away with that kind of inking.